1. The primary mission (Great Commission) has faded. 2. Someone in leadership was afraid to say no. 3. The church is in decline. 4. They don't know what else to do. I have to take issue with you. Some role clarification is in order here, so let me be perfectly clear. You don't know me well enough to speak that way to me. Neither do I know you well enough to allow it. I barely know you and you do not have that kind of role in my life. That is what I have trusted friends, elders, and my wife for - they are my sounding board and I trust them to offer correction to me when necessary - and you are not named among that group. If you have an opinion differnt that mine, that's fine. But to launch into a lenghty discourse advising me how to lead this church, or how my tone should sound on this blog, or analyzing me about the kind of sacrfices God requires of me, is totally presumptuous of you. What do you know about me? And what do you know of my sacrifices? And who are you to "call me out?" Who appointed you to do that? Do you have a habit of speaking to pastors in this manner? Did you speak to your last pastor like that? What gives "you" the right to say such things? Talk about a "tirade." It's apparent that that you have expectations of me, or assumptions of what my demeanor is supposed to look like. Consequentlly, you have felt total liberty to unleash your disappointment in me. For the record, I don't gauge the success of this blog by the number of comments that people leave, and a lack of comments is no concern to me either. It is not my motive for writing. I have things to say and this is where I say them - public opinion notwithstanding. Nor am I concerned that you find it "draining." If you have delicate sensibilites that have been upset by this blog, perhaps you should stop reading it. To use your personal feelings as leverage to correct me or win your approval is ridiculous. I won't do it. This blog is where I get to express my own opinions. And that's what they are - mine - not yours. You will have fewer disappointments and concerns about me if you would focus on yourself, stop reading my blog, and leave the task of leading this church to those people whose job it is to lead. Just so you know, we are in the middle of a realignment process at PCC right now - striving to build a better future by doing away with old habits that die hard - and many of my recent blog entries are a reflection of those discussions. You have no idea of what is happening behind the scenes - but my leadership team and I do. Plus, we happen to know what we are doing. If we are misunderstood along the way, that's fine too. But we will not be sidetracked by uninformed criticisms, nor will I allow them to go unchallenged. 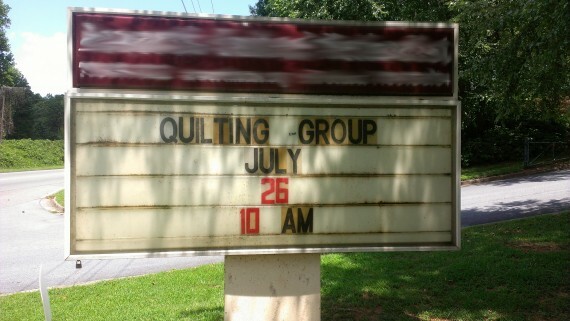 Finally, regarding this Quilting Group blog. Do you know what a hyperbole is? If not, perhaps you should familiarize yourself with the term and how they are used. I use hyperboles all the time - particularly to ensure that our church stays on track. That' why the Quilting Group blog was - a hyperbole and satire. People who actually "know me" understand this about me. My use of satire is well established in the PCC congregation. Consequently, they are not so quick to jumpt to judgment; they just don't take me too serious... like you did.